JST XH connectors were developed based on the high reliability and versatility of the NH series connectors. The connector is very small with a height of 9.8mm and a pitch of 2.54mm. Insulation Resistance: 1 000MΩ min. JST-XH 7 Pin Connector Kit (4 pack) JST-XH connector standard is compact in design, but quite challenging to crimp and assemble. 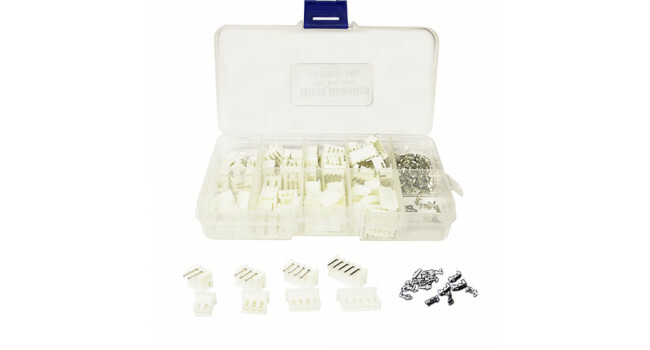 For quick prototyping we thought we give you a hand and bundle 4 x pre..
JST-XH 6 Pin Connector Kit (4 pack) JST-XH connector standard is compact in design, but quite challenging to crimp and assemble. For quick prototyping we thought we give you a hand and bundle 4 x pre..
JST-XH 10 Pin Connector Kit (4 pack) JST-XH connector standard is compact in design, but quite challenging to crimp and assemble. For quick prototyping we thought we give you a hand and bundle 4 x pr..
JST XH 2.54mm Straight QTY=150 Kit JST XH connectors were developed based on the high reliability and versitility of the NH series connectors. The connector is very small with a height of 9.8mm and a..
Dual Inline Header Connector - 40 Pin - Male (4 Pack) These 40 Pin (2x20) dual Inline (DIL) male header connector can be cut into any size. Used with custom PCBs or general custom headers. Quic..
SM Connector 2.54mm Qty=150 Kit This is an awesome JST-SM connector kit. 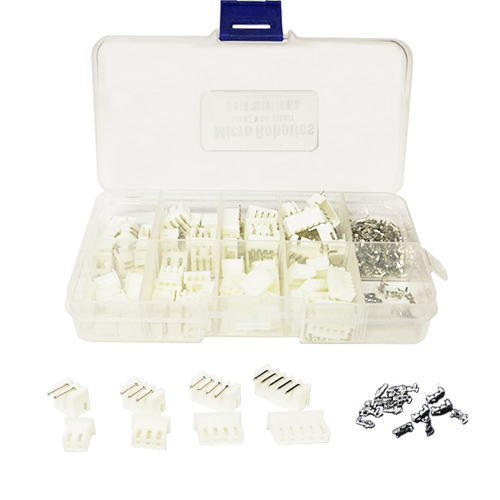 The kit comes with a variety of male and female connectors, so you will always have some on hand for your projects. Quick..
SIL 40 Way Female Connector (4 Pack) Single row of 40-holes, female header. Can be cut to size with a pair of wire-cutters. Standard 2.54mm spacing. We use them extensively in our designs. They mat..
JST XH 2.54mm QTY=50 Kit JST XH connectors were developed based on the high reliability and versitility of the NH series connectors. The connector is very small with a height of 9.8mm and a pitch of ..